Built by renowned German shipyard Abeking & Rasmussen to the highest of standards, the iconic, 190’ (57.90m) LADY SHERIDAN has had the same owner since she launched in 2007. Boasting an elegant interior and exterior design by Donald Starkey, she is lavishly adorned in high-end details throughout. Accommodations for 12 guests in 6 well-appointed staterooms (plus a single berth staff or child's cabin adjoined to the master) feature a full-beam master with a large private study, a walk-in wardrobe, and a generous en suite. Guests are treated to a double VIP on the bridge deck, as well as 3 double staterooms, and 1 twin, and are serviced by 16 crew in 8 cabins. With spacious and comfortable areas, her interior features rich woods such as plane tree, ash, and Makassar. Her main salon features oversized windows, letting the outside in, while seating is in the form of a large, U-shaped sofa, and strategically placed armchairs centered by a coffee table. Neutral tones are accompanied by a pop of color – burgundy – which complements the surrounding wood and marble. Up top, the round-themed skylounge features a guest library, which doubles as a meeting room for internet access, games, or even casual dining. 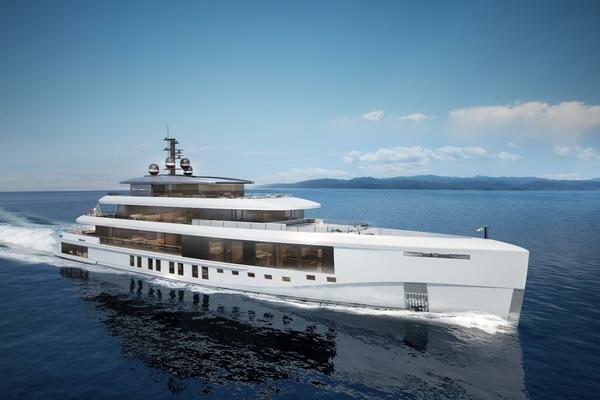 Built with a steel hull and aluminum superstructure, her vast exterior deck spaces span 4 levels, and are each infused with luxury detailing and styling to please most tastes. Her main aft deck features banquet seating aft, while forward lies a large dining table for al fresco dining. The main entertainment area is clearly the sun deck, where a large Jacuzzi, grill, fitness area, and generously sized sunpads offer respite forward. Aft, another large dining table along with comfortable modular seating allows for more casual al fresco meals. United Yacht Sales New Jersey would love to guide you through a personal showing of this 190' Abeking & Rasmussen Motoryacht 2007. This yacht for sale is located in Capri Italy and priced at $39,950,000. For a showing please contact us by filling out the form on this page and we will get back to you shortly!